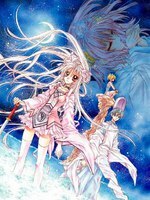 Sakura an orphaned princess in the Heian period who is engaged from birth to Prince Aoba the imperial prince of Japan. She is also the grand daughter of Princess Kaguya who was from the moon kingdom but this knowledge brings with it it's own perials and dangers. Sakura is an orphaned princess in the Heian period who is engaged from birth to Prince Aoba, the imperial prince of Japan. She is also the grand daughter of Princess Kaguya who was from the moon kingdom but this knowledge brings with it it's own perils.